As a fan of college athletics, we will confess to being depressed by the process of recruiting. Some fans are obsessed with it, subscribing to scouting services and reading tea leaves, analyzing every vocal inflection of a 17-year-old kid as if it's going to be an insight to their deeper mindset. (The mindset of a 17-year-old boy, obviously, being "boobies boobies boobies." That, or "could somebody please get this Foley douche away from me, please?") The whole thing is unseemly and sordid; we prefer to just watch our the kids who actually play for our Illini and don't ponder too much about how they got there, or who's coming next. 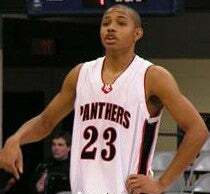 We bring all this up because the fight for star guard Eric Gordon, between our Illini and Kelvin Sampson's Indiana Hoosiers, has been the ugliest local recruiting brewhaha we can remember. Not to bore with you too many details, but Gordon, from Indianapolis, initally verbally committed to Illinois, and then re-opened the door when Sampson, breaking with what some consider a gentleman's agreement concerning verbal agreements, began recruiting Gordon anyway after his hiring. Well, as you'd probably expect, it set both fan bases off and brought out the worst in everyone. Grown men, screaming and shouting and hurling allegations and nasty names, in person and (especially) on message boards, all over the decision-making process of one 17-year-old kid. Recruiting makes us not like sports sometimes. Oh, and Sports Yenta claims to have a source that Gordon is going to Indiana. To which we respond, if true: Those goddamned cheaters they must have paid him off Sampson's a crook Indiana SUXXXXXXXXX!